NEWARK — The guest list and the parade of limousines with celebrities emerging from them seemed more suited to a red carpet event in Hollywood or New York than to a gritty stretch of Sussex Avenue near the James M. Baxter Terrace public housing project here. 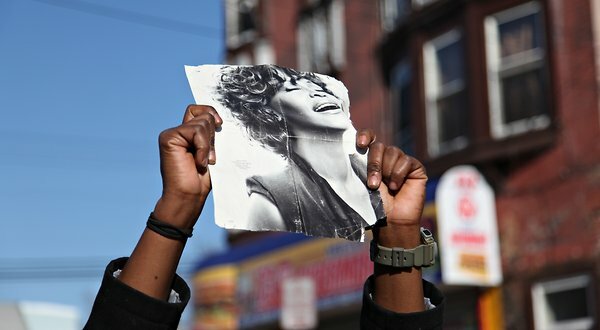 Yet speaker after speaker at the funeral of Whitney Houston on Saturday afternoon kept coming back to her strong attachment to New Hope Baptist Church, where her talents were first recognized and where the funeral was held. Police officers on horseback stood sentinel at the entrance, near an illuminated sign that flashed alternating messages: “Whitney Houston” in pink letters, followed by “We will always love you,” a riff on perhaps the singer’s most famous song. And fittingly, the interior of the red-brick church often resounded with song during the service. Though Stevie Wonder and Alicia Keys and many other performers were well known to the mourners and millions more watching on television, choirs also proved a powerful, soaring presence. Ms. Houston’s former husband, Bobby Brown, did not speak or perform. He arrived before noon dressed in a leather suit, but appeared to stay only briefly, leaving the church after about 20 minutes. Among the speakers at the service were the actor Kevin Costner, who played her bodyguard in the hit film of the same name, and Ray Watson, her real-life bodyguard for the past 11 years. Mr. Watson told of the last moments of Ms. Houston’s life. She had been behaving abnormally at the Beverly Hilton hotel in Los Angeles, where she died on Feb. 11. He said that afternoon she had been listening to her favorite gospel singer, Fred Hammond, as was her pre-performance ritual, just before Mr. Watson left her to prepare for Grammy Awards the next night. Another speaker was Clive Davis, the founder of Arista Records who had helped establish Ms. Houston as one of the most successful pop singers in the world, and whose party she was to attend the night she died. He said that in the days before her death, Ms. Houston, whose substance abuse problems had diminished her vocal strength, told him she was on the mend. Fans of Ms. Houston had begun arriving in in the chilly darkness of Saturday. In the same predawn hours, the police established a metal perimeter that sealed off the streets around the church. Six hours before the funeral, Hedwig Berthold, 40, and Rhonda Owens, 32, two teachers who had spent $600 each to fly here from Miami, sat in their Nissan rental car, hoping to avoid being routed by the police. Nearly three years ago, the two women said, they flew to Michael Jackson’s memorial service in California, where they visited the Neverland Ranch, his parents’ house and the house where he died. Other fans, with commemorative lapel pins and T-shirts, expressed disappointment that they were kept so far from the church. Ms. Houston and her family had a long association with the church. At age 11, she began singing solos in front of the congregation. Her mother, Cissy Houston, a celebrated gospel singer, was the choir leader. The family remained connected to the congregation even after moving to nearby East Orange from Newark. Ms. Stubbs, from Raleigh, said that even though she could not attend the funeral, she had found some solace in being in Newark. “This is the only way I could ease my pain,” she said. Copyright 2012 The New York Times Company. Reprinted from The New York Times, Obituary, of Saturday, February 18, 2012.